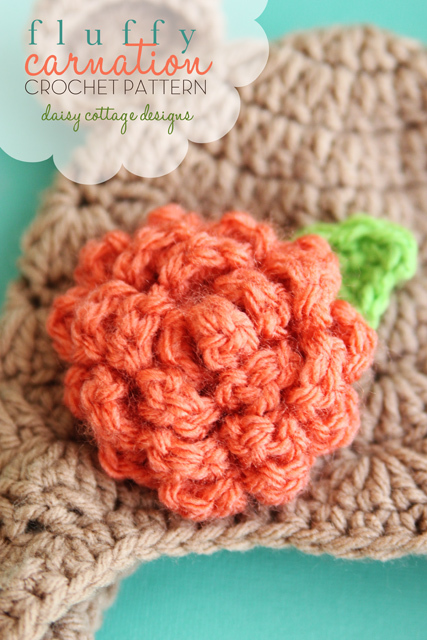 While I’m not exactly sure what type of flower this crochet flower pattern looks like, I know this… I love it. I love the fluffiness and the simplicity of this flower. It would look fantastic on bags, hats, and scarves, wouldn’t it? As I tend to do when I need help (yes, even potty training advice), I went to my Facebook page to get suggestions. The most common response was carnation, but I also got dahlia, peony, and several others. Since most people said carnation, I decided to go with that. 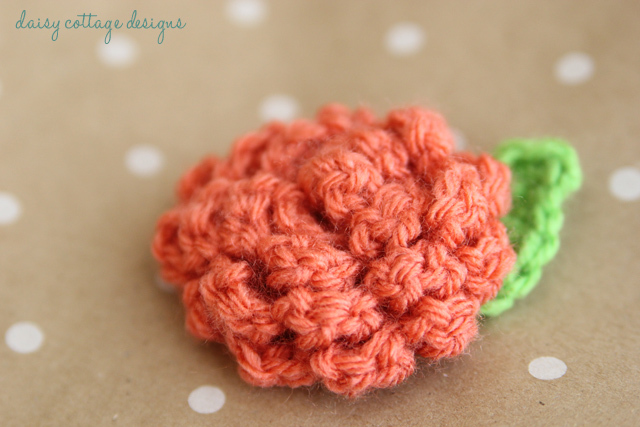 This crocheted flower measures 2 3/4 inches in diameter, but you could easily modify it to make it larger if you wanted to. In fact, I have plans to make several different sizes to cluster together and attach to a crocheted bag for my little girl. If only I could find time to make that bag. left over from another project). With your main color, ch 52. Round 1: sc in the second chain from hook, *sl st, ch 2, 2 dc, ch 1, sl st in the next stitch. Skip the next chain* Do this until you have one chain remaining. sc in the last chain. Leave a long tail for sewing together. As you worked, your flower should have started forming a spiral by itself. Wind your work and create a beautiful flower. Using your tapestry needle, weave the tail through the stitches on the back of the flower. Be sure you go through all layers of the flower. Repeat until the flower is secure. Cut yarn and weave ends. Round 2: You aren’t going to turn your work like you normally would; instead, you’re going to be working into the other side of the leaf. sc in the first stitch, hdc in the next, dc in the next 4 stitches, hdc in the next, sc in the next, sl st in the first sc. Leave a long tail to attach to your flower. Using your tapestry needle, sew your leaf to the carnation. Cut yarns and weave ends. Saw this on Moogly&#39;s link up party- thought it was too cute! I&#39;m loving his pattern. I made a brooch for my mom for Mother&#39;s Day. Now working on brooches for he other moms in my married couples group. I even did one with a different color in the middle. I love this flower and hat color combination. Is there a patter for the hat? Very cute!